Mairead Maguire is very brave. I urge anyone who wants hard-hitting, independent news not found in the mainstream media to listen to Democracy Now! weekdays.. This segment Alba has directed to you is a prime example (as is the recent ecological disaster in Appalachia). You can watch it, or read transcripts any time during the day. You would think an American who was a former Congresswoman, and Green Party candidate for the Presidency, like Cynthia McKinney, in addition to someone with international stature like Mairead Maguire being detained by Israel would be BIG NEWS. We should all be deeply disturbed at the implications that it is not ! 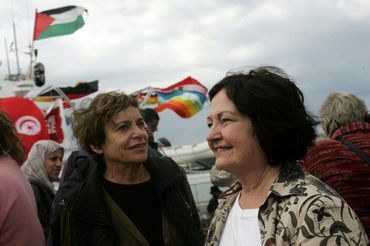 Leave it to Amy Goodman to interview Mairead Maguire from her Israeli jail cell! Of course, first-hand testimony of these events should make the headlines, particularly when you have a Nobel laureate and a US Congresswoman, even if former, trying to deliver humanitarian aid and being detained in an Israeli detention center and then a prison. And, yes, it IS deeply disturbing that this news is not carried by major media ! Five Bahraini citizens participating in the Free Gaza Movement�s voyage to Gaza were deported on Friday, following their Tuesday afternoon seizure by Israeli forces in international waters off the Gaza coast. Coordinator of the Palestinian International Campaign to Lift the Siege Amjad Al-Shawa confirmed that one of the Bahraini nationals is a reporter for the Al-Jazeera network. All five are expected to be escorted to Ben Gurion International Airport where other Al-Jazeera journalists will be awaiting their arrival. Two Palestinian activists and organizers with the Free Gaza Movement were released Thursday, and reported being held in unsanitary warehouse quarters and were questioned by Israeli intelligence. A report from the New York Times said the Bahrainis were kept in a separate facility from other imprisoned solidarity activists like former US Congresswoman Cynthia McKinney and Irish peace activist and Nobel laureate, Mairead Corrigan Maguire. Ireland's Foreign Affairs Minister Miche�l Martin called for the swift release of two Irish nationals detained from the ship including the Nobel Peace Prize winner and a second man identified as Derek Graham. In a statement received by the Free Gaza Movement, Martin said his department has been closely following the situation and was in ongoing contact with Israeli authorities. "My immediate priority is ensuring the safety and welfare of Ms Maguire and Mr Graham and securing their release as soon as possible," the minister said. "I have been assured by the Israeli authorities that they are both well and are being properly treated. An officer from the Irish Embassy in Tel Aviv visited yesterday with Ms Maguire and Mr Graham to provide assistance and will endeavor to make a further consular visit today." "I would again renew my call for the release of Ms Maguire and Mr Graham as well as the other nineteen passengers detained on The Spirit of Humanity," he added. "I would also call upon the Israeli Government to ensure that the humanitarian supplies for the people of Gaza being transported on The Spirit of Humanity are made available as soon as possible to the Palestinian authorities for distribution." The minister called the current Israeli blockade of Gaza "completely unacceptable" and called for all border crossings into the coastal salient to be opened to humanitarian and commercial traffic. The Free Gaza Movement�s ship, the Spirit of Humanity, was overtaken by eight Israeli naval warships in international waters on 30 June. All 22 crew members aboard the vessel were detained and most will be deported, Israeli authorities said. The Israeli navy threatened to fire on the boat, which identified itself as a civilian ship bringing supplies to the Gaza Strip, and noted they had been cleared for sail by Cyprus customs authorities. The ship was nonetheless boarded and taken over, then brought to the Israeli port of Ashdod where activists were taken to prison facilities. Two of the 21 Free Gaza ship crew members were released without charges Wednesday, both Palestinian citizens of Israel, following interrogation by intelligence officers. Nineteen other crew members, including a former US congresswoman and a Nobel Peace Prize winner, remain in prison cells at Israel�s Ashdod jail facility awaiting deportation. The group was overwhelmed by eight Israeli naval warships as they steered a small ferry carrying reporters and humanitarian supplies toward the Gaza Strip on Tuesday. According to the capturing officers the ship was in violation of the Israeli blockade of the area, which was a closed military area as a consequence. Free Gaza members on the Spirit of Humanity were THREATENED WITH LIVE FIRE on 2 occasions, they said, and have pledged to continue their efforts to secure the safe release of the 19 remaining imprisoned crew members, and to continue efforts to break the Israeli siege on the coastal strip. The two members released from prison Wednesday were Lubna Masarwa and Huwaida Arraf, both organisers of the Free Gaza Movement. In an interview with the Israeli news agency Ynet, Arraf, who is also a citizen of Israel, said that authorities "put us in a WAREHOUSE, where we SLEPT on a COCKROACH-INFESTED CEMENT FLOOR, as armed soldiers were monitoring us. "They didn't say a word to us. They confiscated ALL OUR PERSONAL BELONGINGS and PHONES, and they DIDN'T LET US CONTACT ANYONE. A day later they left us at the Ashdod central bus station WITHOUT ANY MONEY or BELONGINGS," Ynet quoted her as saying. "What they did to us is unforgivable, but we're not the story here," she added. "The fact they threatened us with violence because we wanted to transfer medical supplies and drawing equipment for children is simply absurd." Lubna Masarwa and Huwaida Arraf, both organisers of the Free Gaza Movement, have now been released from Ashdod Detention Facility, where military authorities had held them from 9.00 p.m. on 30th June until 1.00 p.m. on 1st July, 2009, having arrested and detained them while in Gazan territorial waters (approx. 20 nautical miles from Gaza Port) at 3.00 p.m. on 30th June. Congresswoman Cynthia McKinney and Nobel Peace Prize Winner Mairead Maguire have given telephone interviews from their prison cells, where they await deportation. To arrange such interviews, contact Free Gaza Movement (either Greta Berlin or Caoimhe Butterly, at +357 99 081 767), who will also supply current news or information as to the whereabouts of those Free Gaza 21 who are awaiting deportation, or the current status of legal negotiations as to those deportations. Free Gaza Movement will continue its activities to break the siege on Gaza, to highlight the plight of Gazans under total Israeli siege and occupation, and to remind the world of the imprisonment of 11,000 Palestinians in Israeli jails or detention centers, under administrative detention, most of them without trial. Israel states that it denied entry to the SPIRIT OF HUMANITY and 21 Free Gaza human rights defenders, because Gaza is a closed military area and �a blockaded area�. The Israeli Navy threatened to fire at the boat and on several occasions during the voyage from Cyprus attempted to stop the boat (at 3.00 a.m. and at 11.00 am on 30th June), when they surrounded it with up to eight naval gunboats. Nevertheless, both Ms. Mosarwa and Ms. Arraf have been released without charge or court appearance. At 2.30 a.m. on 1st July, Ms. Mosarwa was investigated by the General State Security (GSS) � the Shabbak, but not by the police or military. A number of foreign activists are still in detention in a Tel Aviv jail four days after the Israeli navy stopped their boat as they attempted to reach the Gaza Strip. Mairead Maguire, a Nobel peace prize winner, told Al Jazeera on Saturday that the activists had agreed to remain in detention until Israel agreed to free all of the activists. "We said that we were abducted as a group ... and that we would not leave until everyone left and we were happy that all our equipment had been returned," she said. Israeli sailors boarded the Spirit of Humanity, a Greek-registered vessel, on Tuesday off the coast of Gaza and seized those on board. "They forcibly boarded the ship, detained all our passengers and illegally took them to Israel against their will. This is a kidnapping. This is the act of piracy at sea," Ramzi Kyzia, an activist from the Free Gaza Movement, told a news conference in Cyprus. "The Israeli navy made the choice to come out and intercept us and forcibly board us and kidnap 21 international human rights workers and journalists." The activists, who were carrying humanitarian supplies, had set off from Cyprus in an attempt to break the Israeli blockade of the Gaza Strip, which prevents many basic supplies reaching the 1.5 million Palestinians in the territory. Among those detained with Maguire were Cynthia McKinney, a US congresswoman, and two Al Jazeera journalists. Yigal Palmor, the Israeli foreign minister, had said that those who signed an undertaking to return home voluntarily could be released immediately and repatriated on the first available flight. But Maguire told Al Jazeera that some of the activists were considering applying to extend their detention in order to mount a legal challenge against the actions of the Israeli authorities. "We have been issued with deportation orders which have expired today," she said. "We refuse to be criminalised because we wanted to go to the aid of the people of Gaza." Israel imposed the crippling blockade of the Gaza Strip in 2007 after the Hamas movement seized full control of the territory after pushing out Fatah security forces loyal to Mahmoud Abbas, the Palestinian president. International calls for the siege to be eased have mounted since Israel fought a 22-day offensive in the territory in December and January, increasing the hardships faced by the Gazans. Israel said that the war was aimed at ending rocket attacks by Palestinian fighters. arrests and detention, but in terms of 'major media' that's about it!! JERUSALEM � Nineteen foreign activists of the pro-Palestinian Free Gaza Movement were being held in Israel awaiting deportation on Thursday, two days after the Israeli Navy seized control of their boat off Gaza. A former United States Representative, Cynthia McKinney, and an Irish peace activist and Nobel laureate, Mairead Corrigan Maguire, were among those being held. Two additional Israeli activists were released without being charged on Wednesday, according to the group. The boat left Cyprus on Monday and was seized on Tuesday. The activists said they had a cargo of medical and reconstruction supplies and children�s toys. The Israeli military said the aid would be transferred to Gaza subject to security authorization. Ramzi Kysia, an activist with the Free Gaza Movement, said the 19 people being detained were likely to be deported by Friday, once deportation procedures were complete. But he said some might refuse deportation unless all of those being detained were released together and all the equipment of journalists with the group was returned. Speaking by telephone from Cyprus, Mr. Kysia said that 5 of the detainees were Bahraini citizens and that they were being held apart from the others in a cramped facility. The Israeli government has said it is reviewing the embargo policy, but it has not yet made any decisions. Also Thursday, Palestinian reports said that a girl, 17, had been killed by a shell from an Israeli tank in central Gaza and that several others had been wounded. The Israeli military said an army patrol had come under fire along the border in the evening and fired mortars in response. Military officials, speaking on condition of anonymity under army rules, said initial investigations indicated that Palestinian militants had also fired mortars during the clash and that the Palestinian casualties had probably been caused by Palestinian fire. McKinny's was on youtube prior to this, and lots has been coming out since it happend through freegaza, i been posting on FACE. the prior livestream internview from mckinney was on dprogram, she is out the baharains are flown out by their kings, the others still in prision may try to fight the deportation. Come on guys, hundreds of trucks with aid pass to Gaza through Israel every day, Why all this nonsense with the ship? Their only goal was blockage violation, they did it, everyone knows and nobody cares, because it was obvious and stupid. Israel will check their stuff, remove ammunition if any, and send it to Gaza. Then Israel will deport those on the ship. People caring about peace on ME can't give encouragement to Hamas Nazis one way or another. It's not good for Jews and Arabs alike. Hi! I just watched this and it says a great deal! Cherele Moonshine, good one Josh/Joe/and rest of your many personalities, lol! Alan. Good old Marty, you have nothing against Cheryl/Madalena or Jackie/Jessy/Judy/Pete/Other Hamas PR robots, but are looking to blame me for similarity and silence my voice? You have a good reason: you hate IDF because it prevents slaughtering the Israelis, and I call Hamas modern Nazis. You cannot stand an argument, so you and your buddies just force Care2 to close my account and leave Past Member instead. Well, you and all your buddies around can ban my account, but you won't be able to ban the truth and justice. If there's something worse on a forum than a troll, it's a fascist troll. Thank you very much, Alba, noted! Yes, Brigitte, I know and see quite a few of those here. The news is getting old, with those Hamas propagandists sent away from Israel. Ridiculously, they weren't even fined! - which means they will be back soon. You could not be more wrong Cherele! I am not looking to silence your voice at all! As long as it's civil! You are entitled to your opinion! I don't like the IDF because they act like modern day Nazis! I NEVER wish to see innocent people slaughtered, especially not children and animals! And I don't like Hamas or any other terrorist group either! None of these radical murderers do the human race any good what so ever! And I do not mind an intelligent argument at all! I totally agree on the truth and justice because it will prevail at some point. But see what you are doing... You are putting the blame on other people because you don't like other opinions that do not agree with you! You have a dislike for many of us because we don't like what the IDF are doing to the innocent palestinians, meaning the non-hamas civilians. You create profile after profile and they seem to be getting more sarcastic as you go along. What don't you understand about care2 not banning you if you do not violate care2 policy?? Just because someone flags you does not mean you will be banned! You have to violate care2 policy to be banned. At one time I thought you were just a stepford Israeli supporter if not IDF itself. Remember I was once an avid Israeli supporter. However I must admit you are not lacking in the little gray cell department. A probably computer programmer with patents is impressive to me. Personally I wish this IDF/Palestinian ordeal was solved and peace was to be had, that is what I truly wish! I NEVER wish harm upon innocent people so to say that I wish the Israelis would be slaughtered is not only a lie but pretty silly, lol! You obviously did not like the brasscheck video. If they do not pay you "Cherele" though, they should because you do one heck of a job defending them even when they do not deserve it and I am not saying they never deserve to be defended. There is no reason to always stick up for any people when they are wrong however. I do stick up for the Hamas that shoot rockets over to the IDF. What we have here is Hamas nazis fighting IDF nazis in my humble opinion. However it is not the Palestinians that have everything fenced in, controlling the electricity, food and medical supplies. It is not the Palestinians that make a Jewish person slap himself at the border laughing their heads off. It is not the Palestinians that ran over Rachel with a bulldozer or shot british reporters. It is not the Palestinians bulldozing houses to expand their own people's land. One has to use a little common sense when defending a person or persons. You do that by trying to see both sides of the situation as best as you can. I am sure most of us do that before forming an opinion on who is in the wrong and who is in the right. Whoops! I do NOT stick up for the Hamas that shoot rockets over to the IDF! That is what I meant to say! Jail Likely for Ezra Nawi, Israel's Man of Conscience - Didn't Assault Police, as Charged & Convicted, But Antagonizes West Bank Settlers & Authorities, Exposing Human Rights Abuses This has nothing to do with being a robot or supporting Hamas! My name is Ezra Nawi. I am a Jewish citizen of Israel. I will be sentenced on the first of July after being found guilty of assaulting two police officers in 2007 while struggling against the demolition of a Palestinian house in Um El Hir, located in the southern part of the West Bank. Of course the policemen who accused me of assaulting them are lying. Indeed, lying has become common within the Israeli police force, military and among the Jewish settlers. After close to 140,000 letters were sent to Israeli officials in support of my activities in the occupied West Bank, the Ministry of Justice responded that I "provoke local residents." This response reflects the culture of deceit that has taken over all official discourse relating to the Occupied Palestinian Territories. After all, was I the one who poisoned and destroyed Palestinian water wells? Was I the one who beat young Palestinian children? Did I hit the elderly? Did I poison the Palestinian residents' sheep? Did I demolish homes and destroy tractors? Did I block roads and restrict movement? Was I the one who prevented people from connecting their homes to running water and electricity? Did I forbid Palestinians from building homes? Over the past eight years, I have seen with my own two eyes hundreds of abuses such as these and exposed them to the public--therefore I am considered a provocateur. I can only say that I am proud to be a provoker. Because I am a provoker, the police together with their allies have threatened me, beaten me and arrested me on numerous occasions. And when I continued to "provoke" them, they did not hesitate to out me as a gay man; indeed, they spread rumors among the Palestinians with whom I work that I have AIDS. One of the reasons I have been singled out has to do with who I am. It is difficult to explain, but as a Mizrahi Jew (descended from Jewish communities in the Arab and Muslim world), a gay man and a plumber, I do not belong to the elite of Israeli society and do not fit the stereotype of the Israeli peacenik--namely, an intellectual Jew of Ashkenazi decent. Actually, the police officers who constantly arrest me and I are part of the same social strata. I was programmed like them, have a similar accent, know their jargon and our historical background is comparable. And yet, in their eyes I am on and for the other side, the Palestinian side. This simple fact seems to disturb them so much that they have to vilify me; that is the only way their worldview will continue making sense. I threaten them precisely because I undermine the categories and stereotypes through which they understand the world. But the policemen are only actors on this stage. The military, civil administration and the judicial system are all working with the police, and all of them together follow the commands of their masters, the Jewish settlers. This unholy alliance is extremely dangerous, because for them the end--gaining full control of the Land of Israel--justifies the means. In order to advance this end they dehumanize the Palestinians; and because the Palestinians in their eyes are not human, everything is permitted. They can steal their land, demolish their homes, steal their water, imprison them for no reason and at times even kill them. In Hebrew we say damam mutar, taking their blood is permissible. It is important to keep in mind, however, that the evil I confront every day in the West Bank could not have been carried out without the Israeli court system. Judge Eilata Ziskind not only mistakenly found me guilty but she instructed the court to invite a translator for the sentencing, as if I do not speak Hebrew; in her mind I, a Mizrahi Jew, am a Palestinian Arab--and Arabs are, almost by definition, guilty. My case is merely part of a pattern. All the crimes committed by the state and its proxies in the territories over the past four decades were made kosher by the Israeli courts. Therefore, the courts are just as much to blame for the ongoing cruelty. Because I am a provoker the state subjects me to continuing harassment, and yet I have remained persistent. What strengthens me and gives me energy is the widespread and constant support I have always received from political allies. When I was beaten by settlers, when my car was stolen, when I was arrested, I never felt alone. I know that thousands of people, both in Israel and abroad, support what we in Ta'ayush (Jewish-Arab Partnership) are doing against the occupation. "Ezra" in Hebrew means help, and I know that in times of trouble I can rely on my friends for help. Join Naomi Klein, Neve Gordon, Noam Chomsky and thousands of others and tell Israel not to jail Ezra Nawi, one of Israel�s most courageous human rights activists. Nawi, a Jewish Israeli of Iraqi descent, is a threat to the settlers and the Israeli government because he has brought international attention to efforts to illegally remove Palestinians from the Hebron region. He will be sentenced July 1st. While Prime Minister Netanyahu scoffs at Ahmedinajad�s beatings of peaceful demonstrators, here is what happened yesterday, in broad daylight, at the village of al-Safa, inside occupied Palestinian territory. I am reporting the testimony of Dr. Amiel Vardi, and many other supporting testimonies. There is graphic photographic documentation, including a live video clip, which can be seen here - http://news.walla.co.il/?w=/2689/1510076#. The pictures seen here are part of a series that can be viewed at this Flickr site- http://www.flickr.com/photos/activestills/page3/. Further photographic evidence will become available within the next day or two. (Israel has so far not resorted to blocking internet sites.) What Amiel reports is incontrovertible. The activists arrived in the morning at al-Safa to accompany Palestinian farmers to their fields, since it is nearly impossible for these farmers to work their land without the physical protection of Israelis: violent settlers from nearby Bat 'Ayin invariably attack the farmers and chase them away. This time, however, the army and Border Police were waiting, in force�dozens of soldiers (the Border Police are part of the army), including two Brigade Commanders. As usual, they declared the area a Closed Military Zone. But they also immediately arrested the activists and then attacked several of them brutally with fists, rifle butts, and other weapons. They rammed their heads repeatedly against the sides of the military jeeps (you can see this clearly on the Walla video). They severely beat the detainees while the latter were hand-cuffed and defenseless. Even worse, they continued to beat them while transporting them to the police station � stopping the jeeps on the way and attacking their helpless prisoners with clubs. One Palestinian activist, Yusuf Abu-Maria, suffered a broken leg. An Israeli activist, Sahar, had her armed savagely twisted, though fortunately not broken. Many were injured. This was not random violence. It�s the kind of thing that is directed routinely at Palestinian detainees, but this is perhaps the first time Israeli activists have been assaulted so brutally. The sense is that the Border Policemen were acting under direct, premeditated orders. The two Brigade Commanders�the senior officer in this zone, commander of the Etzion Brigade, and the commander of the Kfir Brigade� stood there overseeing the assault. Perhaps they had their orders from above. Internal Security in Israel is now under the direct control of the proto-Fascist party of Lieberman, the Foreign Minister. Let no one claim that such things happen only in places like Iran but never in Israel. Let no one claim that Israel is an enlightened, free country, the very opposite of places like Iran. Let no one claim that the Israeli army is incapable of inhuman cruelty inflicted on innocent victims, whether they are Palestinian civilians or Israelis demonstrating peacefully against the occupation. Already now, as I write, the system Israel has put in place in the occupied territories is barbaric, in every sense of the word. Unless there is massive international pressure and effective protest, that system is not about to go away. Indeed, in the meantime, things are getting worse, on the ground, day by day. Very brave lady.Kudos to her! What a rubbish from anti-Israel biased sources and Anti-Israel and pro-Communist propagandists not related to Mairead Maguire who is probably home by now. Cynthia McKinney entered Gaza with Viva Palestina convoy on July 15, 2009, at 1 pm.